Healthcare & Medical Devices « Global Market Insights, Inc. The global transcatheter heart valve replacement market is slated to emerge as one of the most lucrative investment avenues in the ensuing years, primarily owing to the rising prevalence of valvular diseases and the growing number of patients opting for surgical and minimally invasive replacements. On these grounds, numerous medical device companies have been placing their bets on advanced transcatheter heart valve devices, that would help augment the expanse of this industry, especially in developed regions like North America and Europe. Citing an instance, Edwards Lifesciences recently invested $35 million for an exclusive right to buy Corvia Medical, a company that is committed to an important trial in the U.S for its InterAtrial Shunt Device. The device is also the first transcatheter designed to treat heart failure with the help of midrange or preserved ejection fraction. In a separate transaction, Edwards Lifesciences even acquired assets of Mitralign, a manufacturer of investigational transcatheter annuloplasty system for the treatment of functional mitral and tricuspid regurgitation. It is rather discernible that massive investments and acquisitions by industry leaders will be one of the significant factors driving the global transcatheter heart valve replacement market over 2019-2025. The growing prevalence of pulmonary valve disease and cardiac diseases will further proliferate industry growth. With the emergence of an aging society, heart diseases have become one of the most prominent health problems worldwide. Heart disease incidences are estimated to rise continuously over the next few decades, as the geriatric population of people above 60-years of age are expected to double by 2025 and triple by 2050 globally. The proportion is more likely to affect the Asia-Pacific region, therefore most of the world’s cardiovascular burden is predicted to occur in this area. The prevalence of cardiovascular diseases is considerably high in nations like India and China and has increased gradually over the past few years, however, it is appropriate to mention that the quality of treatment has also improved gradually. Ergo, the rising prevalence of cardiovascular diseases paired with improving disease treatment, including heart valve replacements would lead to APAC transcatheter heart valve replacement market depicting commendable gains in the years to come. Speaking of improving disease treatment, the transapical approach is one of the leading surgical approaches that is lately being adopted on an expansive scale worldwide. Recently, for instance, Neovasc Inc., a leading developer of minimally invasive TMVR replacement technologies, announced that its transcatheter mitral valve replacement device Tiara was featured in an update presentation at the Cardiovascular Research Technologies meet in Washington DC. Tiara is implanted in the heart through a minimally invasive transapical approach without the need for open-heart surgery or using the cardiac bypass machine. Presently, the product is being evaluated in two ongoing clinical trials namely TIARA-I in the United States, Canada and Belgium and TIARA-II in Germany, the United Kingdom, and Italy. According to the latest research by Global Market Insights, the transcatheter mitral valve replacement industry size from transapical approach is anticipated to grow at a CAGR of 14% over 2019-2025. This approach is renowned for valve-in-valve implantations in the in mitral bio prosthesis and the valve-in-ring implantation (deployed in annuloplasty rings, for patients afflicted with acute mitral regurgitation). Hence, an uptick in cases of the mitral valvular disease will generate substantial demand for transapical approaches, thereby augmenting the transcatheter heart valve replacement market in the ensuing years. Furthermore, approval by federal executive departments to reduce the effects of heart failure will further boost market growth. For example, FDA recently approved a new indication for heart valve repair devices that are meant to reduce moderate-to-severe mitral regurgitation and leakage of blood into the heart’s left atrium that can result in symptoms of heart failure such as fatigue, shortness in breath and swelling in the legs. The United States consists of almost 6.5 million adults suffering from heart failure, with a small percentage of these patients also affected by moderate-to-severe mitral regurgitation, increasing the risk of heart failure. Thus, the approval of heart repair devices by major government bodies will also significantly favor the expansion of transcatheter heart valve replacement market in the foreseeable years. 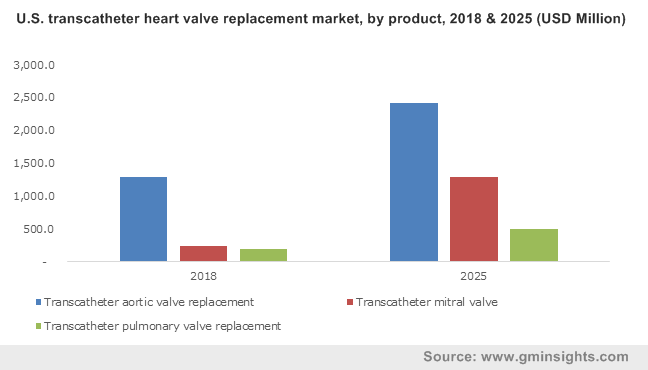 Given the changing trends in the healthcare fraternity, with respect to medical devices and treatment methodologies, the global transcatheter heart valve replacement market is anticipated to undergo a transformation of sorts in the coming years. Indeed, the overall transcatheter heart valve replacement industry size is expected surpass a valuation of $10.5 billion by the year 2025, according to Global Market Insights, Inc. This entry was posted in Healthcare & Medical Devices and tagged Transcatheter Heart Valve Replacement Industry, Transcatheter Heart Valve Replacement Market, Transcatheter Heart Valve Replacement Market Analysis, Transcatheter Heart Valve Replacement Market Growth, Transcatheter Heart Valve Replacement Market Outlook, Transcatheter Heart Valve Replacement Market Pdf, Transcatheter Heart Valve Replacement Market Price, Transcatheter Heart Valve Replacement Market Report, Transcatheter Heart Valve Replacement Market Share, Transcatheter Heart Valve Replacement Market Size, Transcatheter Heart Valve Replacement Market Trends. Drastically changing the paradigm of the global healthcare space, telemedicine market has been gaining immense traction in the recent years owing to innovative and path-breaking technological solutions. Apparently, telemedicine is anticipated to become the most used and accepted method of diagnosis and prescription due to its numerous benefits. It has enabled healthcare professionals to access a patient’s medical records including computed tomography scans, medical resonance imaging scans, electrocardiogram, and X-rays remotely. In this regard, taking note of a few reliable statistics would signify the growing clout of telemedicine industry in the global healthcare sector. Apparently, it is being said that telemedicine had about seven million users in the U.S. during the year 2018 and around 90 percent of physicians working on tele-health platforms. Notwithstanding the proliferation of telemedicine in the developed countries such as the U.S., it is quite imperative to take note of the fact that low-income nations and developing economies too are pouring in considerable resources in laying out a robust pathway for the expansion of telemedicine industry in their respective regions. Despite a large number of healthcare programs undertaken by the private players and government institutions, the Indian healthcare ecosystem faces innumerable challenges including inconsistent quality standards, insufficient public-sector investment, low insurance access, shortage of qualified Medicare professionals, a drastic shift in the disease burden, and growing number of underserved elderly populace. In this regard, general consensus dictates that the requirement of a major intervention is on the cards, and digital technology can provide respite to the Indian healthcare system. Undoubtedly, telemedicine is one such prominent factor that can assist in bridging the gap and increase quality and accessibility of healthcare while reducing the cost of healthcare substantially. It has been well-documented that telemedicine has brought down patient and provider costs in the most remote hinterlands. In 2016, the Indian Government announced the launch of a telemedicine initiative in partnership with Apollo Hospitals to provide healthcare facilities in the rural areas of the nation. Named ‘Sehat’, the service would allow people to consult doctors online and order generic medicines as well. Reportedly, people can now visit Common Service Centers and fix an appointment for seeking expert consultancy with a doctor. In 2018, a Memorandum of Understanding (MoU) was signed between the Development and Education Communication Unit of Indian Space Research Organization (ISRO) to establish telemedicine nodes for the Indian defense forces. It is being said that the joint initiative would drastically transform the reach of telemedicine to airmen, combat soldiers, and sailors deployed in isolated and remote posts. Considering the positive impact of the aforementioned initiatives, it will not be incorrect to state that the telemedicine industry would be one of the key factors which would redefine the extension of quality and affordable healthcare to the citizens of India, especially the ones residing in rural areas. 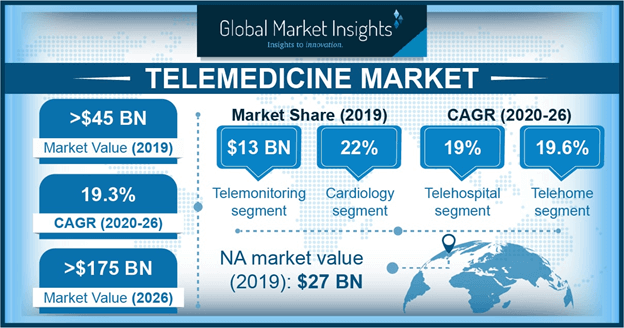 In fact, as per a research report compiled by Global Market Insights, Inc., India telemedicine market is slated to expand at an overwhelm y-o-y growth rate of 22.4 percent over 2019-2025. With the rise of new-age technologies, telemedicine as a practice is going through transformational changes over the recent years and is gaining acceptance as a viable method of patient care. In an era of growing telecommunications network and increasing pace of integration between IT sector and healthcare industry, it is quite certain that the contours of the global telemedicine market – slated to surpass a remuneration scale of USD 130.5 billion by 2025 – indicate a highly-promising outlook for the worldwide medical care space. This entry was posted in Healthcare & Medical Devices and tagged Telemedicine Industry, Telemedicine Market, Telemedicine Market Analysis, Telemedicine Market Growth, Telemedicine Market Outlook, Telemedicine Market Pdf, Telemedicine Market Price, Telemedicine Market Report, Telemedicine Market Share, Telemedicine Market Size, Telemedicine Market Trends. The escalating demand for advanced diagnostic equipment among diabetic and HIV patients, is undeniably sure to fuel point of care testing market trends. The key objective of the product is to generate clinical results quick enough for the appropriate treatment to be implemented, leading to improved clinical outcomes. PoCT becomes increasingly important for patients staying in remote locations as it offers added time to take appropriate steps in case of emergency. Reports from the National Center for Biotechnology Information (NCBI) estimate that the prevalence of diabetes (type 1 & 2 diabetes) will increase by 54% to over 54.9 million Americans between 2015 to 2030, while the annual medical costs related to diabetes will increase by 53% to over $622 billion by 2030. It is thus rather overt that the growing number of patients suffering from diabetes, and even HIV and cardiovascular diseases, will augment the point of care testing industry size in the years to come. The point-of-care testing market share will depict a steady upsurge on account of the changes in healthcare delivery which are aimed at providing affordable care closer to the patient’s home, given that the aim of the product is to offer easier user interface and result accuracy. This is rather significant in the context of applications such as self-monitoring of blood glucose or even nephrology testing, that has become vital on account of the fact that the kidneys are one of first organs to be affected in patients suffering from high blood pressure or diabetes. Indeed, the robust increase in the number of patients suffering from the aforementioned disorders, in tandem with the growing incidences of kidney failure and other kidney diseases, will drive PoC testing industry share from nephrology testing applications, projected to depict a CAGR of 7.4% over 2018-2024. Speaking of the geographical landscape, it is vital to mention that Japan is one of the most crucial regional contenders of the PoC testing market. 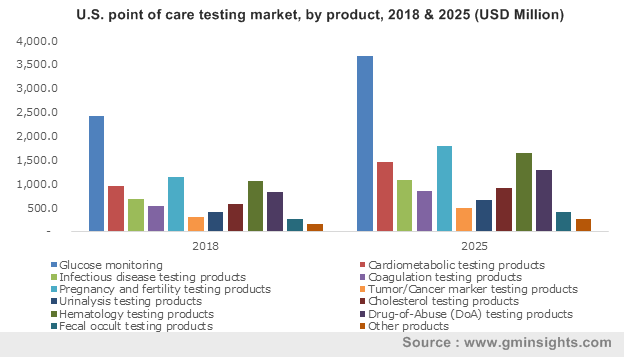 In fact, Japan point of care testing market size is projected to grow at a CAGR of 8.7% over 2018-2024, powered by the rising number of people suffering from HIV and other disorders, that prompts an expansive adoption rate of point of care testing devices in the country. Designers of PoCT devices are constantly seeking ways to make their products easy to use and offer enhanced user comfort. With the growing potential for PoCT to improve healthcare monitoring particularly through timely detection of infectious diseases, developers are focusing on technology that can address the needs of user in a clinically and cost-effective manner and avoid the launch of expensive devices that fail to deliver the required outcomes. For instance, in January 2018, Siemens Healthineers unveiled their new Stratus CS Acute Care System that delivers the needed biomarkers to cover the spectrum of acute cardiac care. The system was reported to efficiently reduce turnaround time from 76 to 20 minutes and 25% reduction in total costs for point-of-care cTnl testing. The trend of testing performed outside of the conventional labs has undoubtedly increased in recent times, driven by the need to offer healthcare closer to the patient’s bedside. The increasing use of well-established PoCT technologies will offer easier-to-use, affordable, accurate, and compact healthcare monitoring capabilities, fostering the trend further. With growing technological advancements in the healthcare sector and rising patient population, the fad of out-of-the-lab testing will certainly characterize point of care testing market in the years ahead. Small handheld PoCT devices have been projected to gain traction in the times to come, given that these are portable and can be used by patients or healthcare professionals in locations close to the patient such as by the bedside, in the clinic or in the patient’s home. These devices encompass an all-in-one diagnostic feature that makes them all the more desirable in the emergency rooms in a hospital. For instance, small, portable devices most often deploy fingerstick, capillary samples without the requirement for sample containers, and further avoid the transport of samples to labs located far away from the patient. In essence, the product’s high convenience and reduced risk associated with testing procedures will augment the future dynamics of the overall point of care testing market. This entry was posted in Healthcare & Medical Devices and tagged Point of Care Testing Industry, Point of Care Testing Market, Point of Care Testing Market Analysis, Point of Care Testing Market Growth, Point of Care Testing Market Outlook, Point of Care Testing Market Pdf, Point of Care Testing Market Price, Point of Care Testing Market Report, Point of Care Testing Market Share, Point of Care Testing Market Size, Point of Care Testing Market Trends. In recent years, electrophysiology market has emerged as one of the most lucrative revenue generating business spheres of the healthcare sector. The increasing popularity of electrophysiology for performing diagnostic studies by collecting radiologic and electrocardiographic data of patients is one of the prominent factors propelling the product demand. In addition, healthcare service providers have also been giving preference for electrophysiology for ensuring patient comfort and safety. Taking into account the surging adoption of this methodology, several companies involved in the electrophysiology industry have been looking forward to expanding their product portfolio to gain competitive benefits. The regulatory bodies like FDA have also been encouraging companies to develop adequate products for troubleshooting the existing challenges regarding electrophysiology cardiovascular practices. The prevalence of cardiac problems across the globe has been witnessing a steep rise lately. In most of the regions mainly across the African continent, due to lack of medical facilities, patients with severe cardiac conditions often succumb to the disease sooner than ever. On these grounds, renowned hospitals have been taking initiatives to deploy advanced healthcare facilities across African countries. Merely a few months before, in Kenya, the Agha Khan hospital located in Mombasa decided to start an cardiac electrophysiology program. With this initiative, the Agha Khan hospital has become only hospital in East and Central Africa equipped with an electrophysiology facility at affordable prices. Such initiatives taken by the healthcare service providers across African contents to enhance the livelihood of the regional masses with the deployment of advanced medical essential services are poised to propel Africa electrophysiology industry size over the years ahead. Speaking more about the regional presence of players in the electrophysiology market, it is prudent to mention that prominent companies have been concentrating on launching a new range of products across various geographies. Recently, focusing on the increasing need of noise cancellation during the collection electrocardiographic data, BioSig Technologies Inc., has developed a non-invasive electrophysiology system that can acquire high-fidelity cardiac signals. The collection of clear cardiac signals can potentially improve the efficiency and accuracy of electrophysiology studies. For this recent launch, BioSig Technologies also received a 510 (K) clearance from U.S. Food and Drug Administration (FDA). Prior to the clinical trials, BioSig Technologies has worked with several medical centers and clinics in the U.S., that have seemingly helped this medical device company highlight the limitations of its existing electrophysiology practices. In 2017, BioSig had also signed a 10-year partnership agreement with a non-profit academic medical center, Mayo Clinic that helped the company develop a healthcare platform and expand its facility centers across other areas of clinical importance. Powered by such collaborative deals with clinics and medical centers, companies such as BioSig Technologies have been looking forward to expanding their reach in electrophysiology market. In the last few years, pertaining to the ease of technical operations, reliable performance, and powerful consoles, cryoablation systems have gained more popularity than ever before. Considering the growing importance for EP ablation catheters across the globe, the players in the electrophysiology market have been investing in advancement of existing cryoablation systems. Validating the aforementioned fact, in the mid of 2018, BTG plc launched an advanced version of its already existing cryoablation systems that facilitates effective and precise treatments without any need of surgery. The updated version will observe a tremendous demand as patients have been giving preference for minimally invasive treatments. 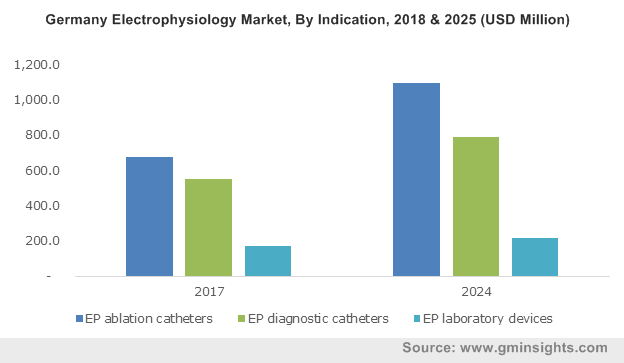 For the record, in 2017, EP ablation catheters held approximately 48% share of electrophysiology market which is expected to grow over the years ahead on account of the growing involvement of companies in new product development. Hefty investments in clinical research and new product innovations to gain long-term revenue benefits are slated to enhance future product demand. 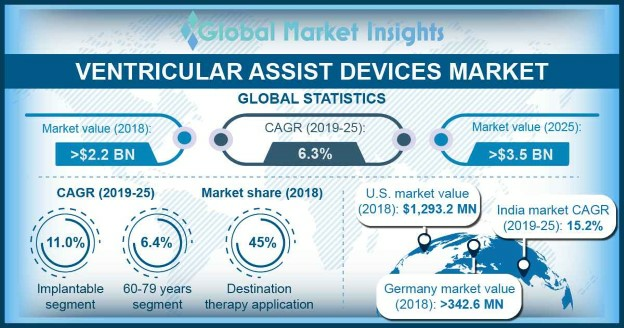 The growing popularity of minimally invasive therapies will favorably encourage industry magnates to conduct in-depth research and development activities, that will further influence the industry trends. Driven by the growing number of clinical research activities across the globe, electrophysiology market will generate a revenue of more than USD 6.5 billion by the end of 2024. This entry was posted in Healthcare & Medical Devices and tagged Electrophysiology Industry, Electrophysiology Market, Electrophysiology Market Analysis, Electrophysiology Market Growth, Electrophysiology Market Outlook, Electrophysiology Market Pdf, Electrophysiology Market Price, Electrophysiology Market Report, Electrophysiology Market Share, Electrophysiology Market Size, Electrophysiology Market Trends. The increasing prevalence of diabetes, especially among the global geriatric population is likely to expedite advanced wound care market trends in the years ahead. This can be credited primarily to the rising occurrence of chronic wounds resulting in limb amputations among diabetic patients. Data released by the World Health Organization (WHO) revealed that over 400 million people are affected by diabetes worldwide. Given today’s lifestyle and dietary trends the occurrences are projected to continue to escalate. Back in 2016 alone, diabetes was the seventh leading cause of death with almost 1.6 million deaths directly credited to diabetes annually. Although several people experience wounds, cuts, and minor scratches or ulcers, for people with diabetes, even minor wounds can lead to major consequences. Several people affected by diabetes develop wounds that never heal or do so at a slow pace. Wounds that cannot be cured pose a high risk of infection that can rapidly spread to tissues, bones or other parts surrounding the affected area, which in some cases can lead to deadly complications. These patients thus form a pivotal part of the consumer base for advanced wound care market companies. Speaking of wound healing, it has been speculated that slow healing wounds constitute one of the most dreaded and common complications of diabetes. In the United States alone, around 15 percent of diabetic patients are estimated to get one at some point in their life, with caring costs accounting for $20 billion every year, excluding an estimation of 2 million workdays that are lost due to foot wounds that won’t heal. Considering the major drawbacks of diabetic wounds, doctors are consistently focused on developing advanced wound care methods, specifically a slew of wound therapy devices and wound dressings, so they don’t lead to severe treatments like limb amputations. Additionally, with technological advancements in wound care, there have lately been fewer cases of amputations. For instance, a study conducted in 2012 stated that the rate of leg and foot amputations among adults affected by diabetes in the U.S. decreased by 65 percent from 1996 to 2008. Wound dressings, encompassing myriad dressing techniques such as hydrogel dressings, foam dressings, antimicrobial dressings, and the like, form a pivotal part of the product landscape of advanced wound care market. This is primarily on account of the plethora of dressing styles available that can be individually scrutinized and used for numerous types of wounds such as venous ulcers, open wounds, burns, stalled wounds, necrotic wounds, and broken skin. Apparently, in 2017, would dressing held the highest proportion of the advanced wound care market share. Of late, advanced wound dressings like trauma hydrocolloidal dressings are used to promote oxygen circulation in and around the wound, speeding up wound healing. Other types such as hydrocolloidal dressings that are not just latex free but also biocompatible with the patient’s body are also being deployed extensively. Powered by the massive variety of advanced dressings available and the incredible benefits delivered by these dressings for wound healing, advanced wound care market size from wound dressings is anticipated to depict a CAGR of 4.8% over 2018-2024. The availability and awareness related to wound care especially in developing nations is likely to generate substantial demand for these products in the years ahead. As per a report compiled by Global Market Insights, Inc., advanced wound care market size is slated to cross USD 13 billion by 2024. This entry was posted in Healthcare & Medical Devices and tagged Advanced Wound Care Industry, Advanced Wound Care Market, Advanced Wound Care Market Analysis, Advanced Wound Care Market Growth, Advanced Wound Care Market Outlook, Advanced Wound Care Market Pdf, Advanced Wound Care Market Price, Advanced Wound Care Market Report, Advanced Wound Care Market Share, Advanced Wound Care Market Size, Advanced Wound Care Market Trends. The exponentially increasing deployment of liquid handling instruments in chemical and biomedical laboratories has been fueling liquid handling systems market from the last few years. These systems are extensively used in laboratories owing to the fact that they help reduce the time required for performing laboratory tasks and increase the working efficiency and accuracy. On these grounds, most of the life science research organizations have also been preferring liquid handling solutions on a large scale. Considering the heavy product demand across healthcare, chemical, and biomedical sector, players in liquid handling systems market are investing heavily to launch advanced product ranges. Indeed, in the last few years, a wide range of next-generation products have emerged in the liquid handling systems market which generated a revenue of USD 1.4 billion in 2017. Speaking along the same lines, a few days before, the California based, biotechnology tools company, Labcyte launched a new range of liquid handlers integrated with acoustic droplet ejection technology. It has been investing in research and development activities for quite a while, to revolutionize the liquid handling tools. In this newly launched liquid handling system, it has integrated several other lucrative features that help avoid the chances of cross-contamination of liquids. It also improves data quality which is one of the vital factors in life science research and is used to revolutionize workflows in genomics, drug discovery, precision medicine, and synthetic biology. As of now, end-users have been giving preference for highly accurate, touchless, fully automated, and low-volume dispensing fluid transfer equipment. In regard to this, companies have been developing advanced versions of liquid handling systems. The heavily advanced systems will quite overtly, observe more demand from the end-users. For the record, Labcyte’s instruments have also imprinted a similar influence on the players in the biotechnology and pharmaceutical industries as well as research organizations, service laboratories, academic institutions, and hospitals. Validating the aforementioned fact, in April 2018, the well-known pharmaceutical company, Merck, signed an agreement with Labcyte Inc., to use its patented droplet ejection technology in drug discovery and development activities. The development of modernized products has thus been generating new opportunities for the players in the liquid handling systems industry. Speaking more about the recent advancements, a renowned manufacturer of electromechanical and pneumatic systems and industrial automation, Festo, launched a next-generation liquid handling system to automate the biomedical research activities including sample inspection, cell and genome research, and in-vitro diagnostics. The ability of automated products to handle the fluid sample at high speed with precision will transform the future of the companies that are investing in the invention of automated liquid handling systems. 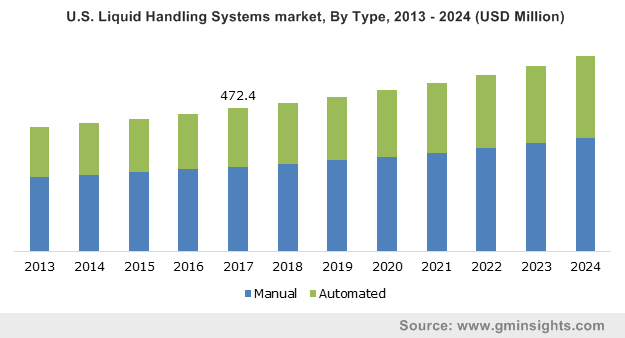 In line with the increasing popularity of automated medical devices, automatic liquid handling systems industry will register a CAGR of 5.9% over 2018-2024. With the surging demand for automatic liquid handling systems, companies have also been looking forward to diversifying the technology and product development tactics by acquiring the firms that have been manufacturing next-generation medical devices. For instance, a technology-focused investment firm, Battery Ventures has recently acquired TTP Labtech Ltd which designs and develops liquid handling equipment. This acquisition will help Battery Ventures to strengthen its profile and gain popularity in the growing life-sciences market. Nowadays, laboratory equipment manufacturers have been taking the help of the latest hardware facilities and software as well, that have been turning out to be rather beneficial to lower the design time and speed up the installation. The use of the latest technology for product development has been helping them to gain competitive benefits by launching the newer versions in the market within a shorter time. It is noteworthy to mention that the growing involvement of companies in product advancement activities will significantly improve the industry trends in the years to come. The increasing availability of a wide range of automated liquid handling systems will further strengthen the product demand noticeably. Driven by the on-going innovations and the trend of mergers & acquisitions, liquid handling system market will surpass a revenue collection of USD 2 billion by the end of 2024. This entry was posted in Healthcare & Medical Devices and tagged Liquid Handling Systems Industry, Liquid Handling Systems Market, Liquid Handling Systems Market Analysis, Liquid Handling Systems Market Growth, Liquid Handling Systems Market Outlook, Liquid Handling Systems Market Pdf, Liquid Handling Systems Market Price, Liquid Handling Systems Market Report, Liquid Handling Systems Market Share, Liquid Handling Systems Market Size, Liquid Handling Systems Market Trends.